Halloween has evolved for me as a parent. I used to get away with one block of trick or treating, then the kids got wise and realized that there were more houses to hit up. When my daughter was old enough to be the chaperone, she took charge of my niece and son while my neighbors and I barbecued and haphazardly distributed candy. Now the kids go their own way and I watch the parade of costumes in between spooking myself. Here are movies that will have you reaching for an extra blanket and sleeping with the lights on. I must add that there are some spoilers. Read with caution. My husband and I saw this movie a few days before my first and last camping trip. He thought it would be hilarious to exploit my fear by placing a wooden idol near the front door, the exact kind that sets off the chain events that lead to the demise of the three characters. The legend was that the Blair Witch would capture two children, force one to stand in the corner playing hopscotch while she killed the other. In the last scene of the movie, Heather runs into the basement to find her friend, and the camera does a pan to him in the corner doing a slow hop, and then the screen turns to fuzz. The rebooted version made a mockery of the quiet fear that built in the original. 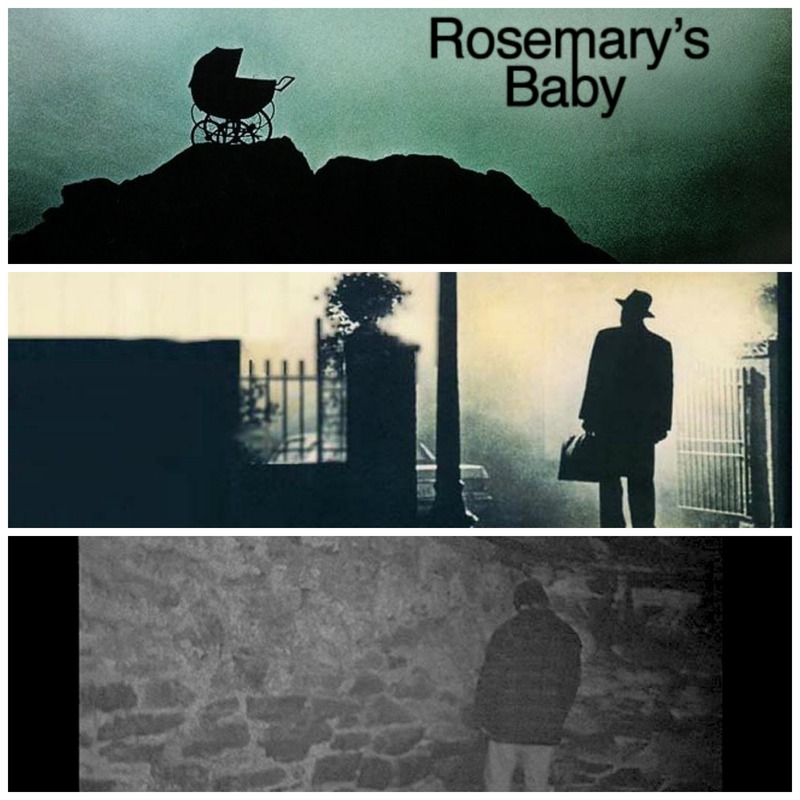 In the original, tension builds as Chris MacNeil tries to figure out how her adorable daughter has become so ill. She sees doctor after doctor until the only thing she feels is left is to perform an exorcism on her child. What scares me about this movie is Father Karras. To this day, I still don’t know if he jumped from the window to free the child of Satan or if his faith was not strong enough to fight. The special effects left me sleepless many nights as a child, but as an adult, I always worry if my eternal soul will burn because my faith is not strong enough. I liked the book much better. That said, I think the fear of this story was more about a woman so easily manipulated by her husband, and that every time she attempted to get help, no one believed her. Despite her sweet behavior, it was frustrating to watch Rosemary ask, then beg for someone, anyone to believe her, and be thwarted at every turn. Identity theft was Patricia’s Highsmith’s hallmark, between this and Strangers on a Train, mistaken identity has always been a fear. The current climate we live in does not lend itself to assist, with online-armchair jurists digging up things, throwing it, and seeing where it sticks. The movie isn’t scary, more creepy. The idea that a man can adapt to the necessary role he needs to play, then co-opt another’s identity is stuff nightmares are made of. Matt Damon will forever be the creepy dude skulking about, envious of Jude Law’s carefree life. When I originally watched this, I was too young to appreciate Jack Torrence’s slide into alcoholism which led to his mental incapacity. What scared me about this movie was the creepy “hotel” guests that popped up when young Danny played alone in the hotel. This was a time when my mom would pile us into the car and we would “get away” for a weekend in a hotel. 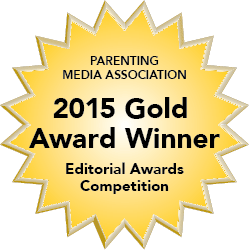 While my mom chilled, my sister and I would play in the halls, or have elevator races (My mom was never a helicopter parent). One hotel we stayed in was pretty decrepit, and as a twin, someone would make a crack about my sister and I being those “little girls from the Shining”. My uncle to this day, continues to labor under the delusion that I am a boy. Probably because one of my aspirations as a kid was to be a stunt double. Women’s Lib had yet to replace Black Power in my Southwest Philly neighborhood. I can recall the day my uncle told me to “turn up the TV, Boy, and watch this with me.” I was in the chair closest to the kitchen (bringing him ice water was my “payment” to hang with him) and my uncle lay calmly on the couch. 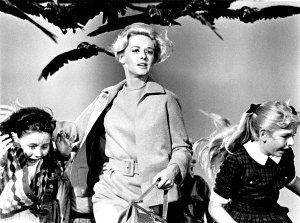 I watched in growing horror as first Suzanne Pleshette then Tippi Hendron were attacked by birds in a California town. To this day, I cannot see a bird without wincing in fear and making a fool of myself. I have candy corn, a pencil scarf I’m working on and control of my remote! What are your plans for Halloween night?